HOW ABOUT THAT?! 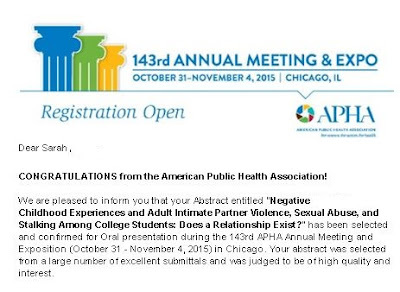 In case you aren't really interested in reading the fine print, I will tell you that it says I have been accepted to present my research as an oral presentation during the national conference in Chicago this year! I am insanely excited, which is better than insanely terrified. Last year I presented at this conference during a poster session, which is still a big deal, but getting bumped up to an oral presentation is sorta huge. Corrine and I actually have four other areas of our research being presented during this conference, which is INSANE, but this one is special to me because it's really my primary area of interest and something where I am taking the lead. The other four (FOUR) Corrine will be presenting, so I will be helping put it all together before we go, then be there for support/smiles during the actual event. In addition to these FIVE FREAKING PRESENTATIONS in Chicago (we REALLY didn't think they would all be accepted), we were also recently accepted to present at a conference in Salt Lake City in September and another in Seattle in December. That's a lot of fall travel, but it's also three huge opportunities to get our research out there in front of people who are passionate about the things we are studying. It's all actually a pretty big deal, professionally. And since I am now working in a field I love, it's a big deal to me personally as well. So, here's to conferences! Expect lots of travel posts this fall. Oh well done you!!! Such amazing news, I'm so proud of you! You are AMAZING! So happy for you! !